Boogie is a whopping 26 lbs. Too big to fly. 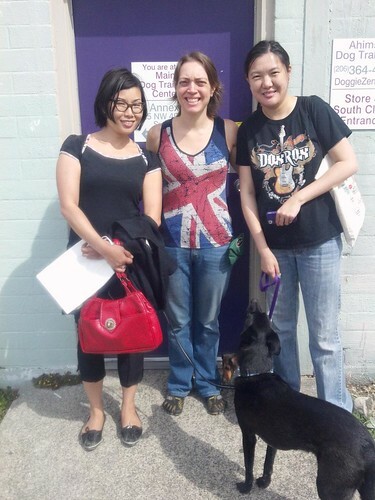 In Seattle I had the pleasure of visiting the huge and impressive Ahimsa Dog Training Center where I met up with Grisha Stewart (author of the BAT book that I illustrated) and her amazing Peanut, a dog of many skills and tricks. I also finally met Jen and Gigi whom I have known for YEARS on the internet. I have drawn Gigi the doxie girl, many times and she is so much tinier in real life than how I always imagined her! My drawings of Gigi also appear on the labels of Jen’s custom-made lipbalms: Your Lips But Better. We had breakfast, walked the dogs, visited the Fremont Troll under the bridge, and took photos. It was fun! It’s great to be back home with Boogie. After a week on Temaril-P, he is less itchy but I am still concerned about the hair loss… there are bald spots and some areas where his coat is scary thin. Back to the vet on Friday. In other news, the MALL DOGS documentary that I hope to be working on, has not met its Kickstarter fundraising goal so if you have backed this project – THANK YOU! – You won’t be owing Kickstarter any money. We are now asking for support over at www.dogparent.com Please spread the word and chip in if you can. Last but not least, I am registered to attend Clicker Expo 2013 in San Francisco! Three days! Woohoo. I have also already picked the seminars that I want to go to. 🙂 Anyone going to Clicker Expo next year? I would also LOVE to go to the Bob Bailey/Sophia Yin event in November, but alas, unless a miracle happens or a very high-paying job comes in soon, there is only so much travel that I can afford to do this year. Share this post across all forms of social media and encourage others to participate! 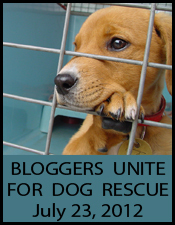 I could blog about my rescue dog Boogie, but we’ll take a little break from Boogie for now. I want everyone to know about a new documentary film project called MALL DOGS. The film is by Jessi Badami, whom I met at Clicker Expo last year. We sat next to each other in the Kay Laurence seminar, chatted, exchanged business cards, and kept in touch over the year. Jessi is amazingly prolific – she writes, she acts, she makes films, she rescues dogs, and she was going to enroll in the Karen Pryor Academy this year but changed her mind and decided to concentrate all her energy instead on making this documentary about Lucky Paws, a very unique and successful pet shelter in Albuquerque, NM, that is located inside a mall. You can read more about this film on: the Dogparent.com website and on the film’s Kickstarter page. In short, MALL DOGS is an uplifting rescue story and I can’t wait to work on it. I will be creating illustrations and animations. However, the Mall Dogs project can not happen if it doesn’t receive full Kickstarter funding in 30 days! Please donate. You can pledge any amount from as little as one dollar. Higher donations come with bigger and better premiums! Then, please share this blog post, tweet it, facebook it, pin it, do your social media thing. The whole incident brings up some horrible memories for me, being the owner of a dog that has bitten people (even before I adopted him), and we’re talking Level 1,2,3, and 4 bites . I can personally relate to how traumatic it must be for everyone – the person who gets bitten, the dog, and the owners of the dog. The first time that this happens is especially traumatic. 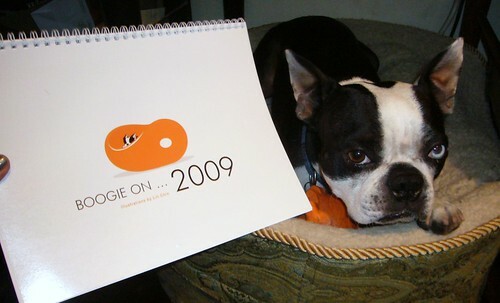 I was fortunate that the person that Boogie had bitten with a Level 4 bite was a dog-lover and did not sue me, and that Boogie does not look like a pit bull. But I did spend $$$$ as a result of that incident and I remember the emotional trauma I went through dealing with the authorities who wanted to take Boogie away from me and dump him back in a shelter. I fought really really hard to keep him, claiming as much responsibility as they would let me. Last thing I wanted was for Boogie to be back at a shelter or rescue. This was a life-changing incident as you can imagine and one that has led to me learning everything I could about dog behavior, and sharing all these illustrations. The news reports are upsetting because the implication is very clear that the “aggressive dog” is to blame. Max the biter was quarantined for 10 days not for rabies testing as they say (this is not technically possible) but because he had bitten someone and was therefore considered a dangerous criminal. His “crime” was worse because it was to the FACE (as opposed to a foot or hand, I suppose). Never mind that the news anchor was the one who stuck HER face in his face by kissing him on the nose and freaking him out. No doubt her intentions were loving. Most people don’t know how to correctly greet a dog and/or don’t know how to read signs of discomfort in dogs until something bad happens. Argentine mastiffs, also known as the Argentine Dogo, are known as big-game hunters and historically have gone after wild boars and pumas. While they are now used as pets, they were bred from a rather violent group of dogs. Because of the dogs’ violent nature, several areas have banned the breed, including Aurora, Colorado. Aurora is the neighbouring city to Denver, where the broadcast took place. The animal is also banned in New York City public housing, and laws in the UK allow police to take the dogs away from their owners and prosecute them. And so poor Max has become a dog “with a history of aggression”. Branded a bad dog. ME: Sorry for the wait, I was putting my dog in the crate. MAILMAN: You said that three years ago. MAILMAN: You really love that dog don’t you? MAILMAN: That dog bit me, you know? Several years ago, the mailman reached out to pet Boogie and Boogie snapped at him. No skin broken. I started looking for a trainer around this time. ME: I know, and I am really sorry. He hasn’t bitten anyone since I started training him. MAILMAN: Yeah, three years ago you said you were training him. Three years ago. Why is he still barking at me? ME: He has not bitten anyone since. As for barking, this isn’t personal. You have to understand – you are the mailman, you are someone who comes and goes… you are not part of the family. And a lot of dogs have a problem with mailmen. There is really nothing personal in this and it’s something I am trying very hard to control. In fact I can’t control everything that my dog does. It’s not easy. MAILMAN: That dog is a problem. ME: I know he isn’t the perfect dog and this is why I keep working with him. Did you see I put frosting on the windows? MAILMAN: It has been three years. I don’t know how you could love a dog like that. 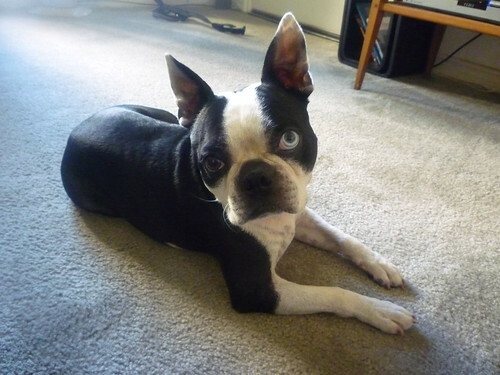 In light of reading about the Denver incident, my own memories being dredged up, the drafting of this blog post, the last thing I needed today was to have someone try to make me feel guilty (in a passive aggressive way) for keeping and loving a “bad dog”, and for putting me on the spot to explain Boogie’s behavior. This mailman has had Boogie’s barking explained to him so MANY TIMES before by myself and by dog trainers. (barking is reinforced by mailman leaving etc etc ) He clearly does not want to understand dog behavior, accepts no explanations, hates my dog, and I really don’t know what else to say. When the mailman left, I burst into tears. Even though I personally don’t believe Boogie is a bad dog, and why should I care what other people think, it is still upsetting. I can’t help feeling immense empathy right now for “bad dogs” and the owners of these “bad dogs” everywhere…especially those of us who are trying so hard to educate ourselves and others. One aspect of the video overlooked in most commentaries is the owner’s behavior. The owner held the collar tight,but the dog was on leash. 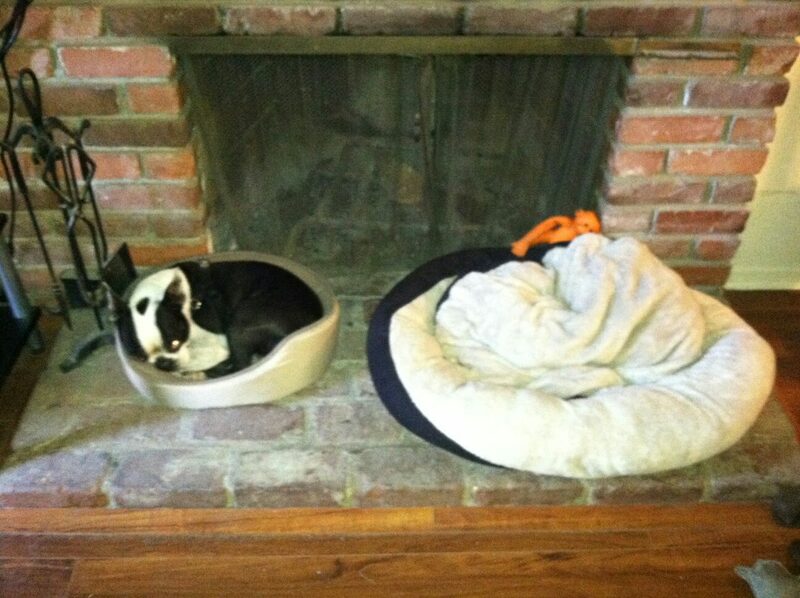 The owner may not be a great reader of canine body language, but he knew his dog was uncomfortable. The owner held the collar tight because he felt his dog had the potential to act out in the situation. Why couldn’t he express this feeling? Because it would require a tacit admission that his dog might act “aggressively.” Dog aggression is taboo, especially from a Dogo Argentino. So the owner pretended his dog was fine, while tightening up on the collar. Now, after the bite, the owner is forced into a defensive position regarding his pet’s behavior, with no lesson learned. Dog owners need to feel more empowered to tell people when their dog is uncomfortable. I found this video of last year’s ClickerExpo on YouTube. Wow. The next Clicker Expo is in January 2011, Newport Beach and I would love to go… Unfortunately for this novice aficionado, the $369 fee to attend the full 3 day event is ridiculously high. The minimum price of $240 to attend one day is still expensive. $240…I could buy 2 pairs of shoes or spend 1 night at The Madonna Inn. Who is going to ClickerExpo next year? Another event that I am excited about is the Boston Tea Party. Boogie and I will be there!!! This is a free fundraiser meet-up event and there will be hundreds of boston terriers and their people. I can’t wait to meet Chopper the Biker Dog. 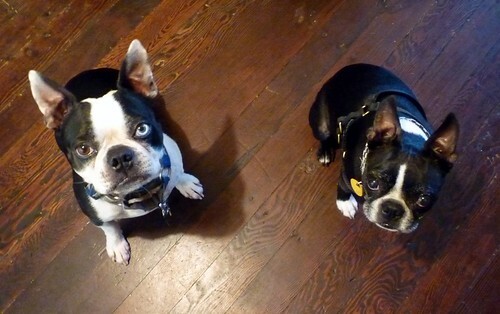 Last but not least, here are some cute photos of Boogie and Butch (Christa’s). 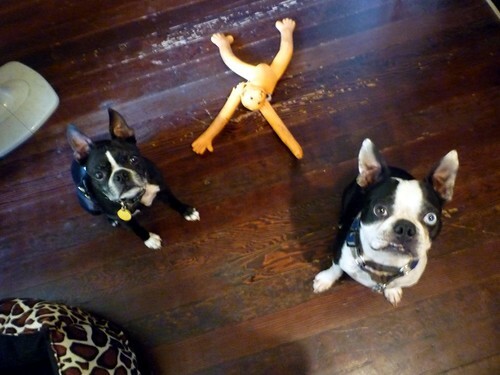 Nothing like a good treat to get these little doggies to sit patiently and pout at camera. I got around to watching this 2-disc DVD today and it was very interesting. Sarah Kalnajs is a behaviorist who does temperament testing on shelter dogs to figure out what the dog’s “behavior problem” is (assuming that this is why the dog was surrendered) so that the shelter can decide on whether the dog is adoptable, and by whom. To be honest, it was quite stressful to watch because there is a lot of footage of dogs displaying anxious behavior. Sarah K makes it clear that we have to look at these signals in context rather than in isolation… We should look at the whole body and what else is happening. Stress signals aren’t necessarily a bad thing or a cause for alarm. But it is important that we notice them because they are usually triggered by something that we (or the environment) are doing to the dog that may be invasive. – Slow movement or lack of behavior IS a behavior. A dog may not move much; he may not appear scary or stiff, but if he doesn’t offer any behaviors, and shows little or no movement or interest in food or whatever we are doing, this can be interpreted as a stress signal. – A wagging tail, contrary to what we have been taught as kids, DOES NOT mean that the dog is friendly and wants to be petted. If the tail is high up and wagging fast, this signals “arousal” and could in fact lead to aggression.The only time that it is safe to pet a dog is if his tail swishes around in slow big circles like a “windmill”. Not that this applies to Boogie, who doesn’t even have a tail. 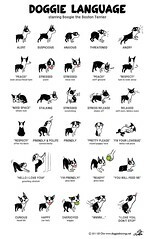 – Distance Increasing signals (eg, hard eyes, ears forward, heightened posture, tail up, excessive barking etc.) = “Back off”. She distinguishes between the “Rollover” and the “Tap Out”. The former is when a dog’s whole body is relaxed and/or wiggly and he wants a belly rub. But if a dog lies down and shows other signs of stress, and then gets back up again after you retreat, this is a submissive “tap out”. He does not want to be touched. The later part of the DVD shows behavior sequences when shelter dogs are being assessed. In most cases, Sarah K performs certain actions to elicit the problem behaviors (eg, touching the dog’s body or food with a fake arm-on-a-stick)… and offers explanations of what is going on. Some dogs appear totally friendly, then turn suddenly and bite!!! (HELLO, Boogie!) Sometimes the warning signals are really subtle; sometimes they only come out when food is present or when a person does something to freak the dog out, eg, touch his tail. It is sad to know that some of these dogs will be euthanized if they don’t pass the temperament test… like one puppy that showed subtle signs of aggressive behavior that she believed would get worse in adulthood. I don’t understand why this puppy was considered untrainable. There are also heartwarming examples of dogs who improve after spending time in a foster home with TLC (away from the stress of the shelter) and become place-able in forever homes, which reaffirms for me why rescue and fostering is so important. 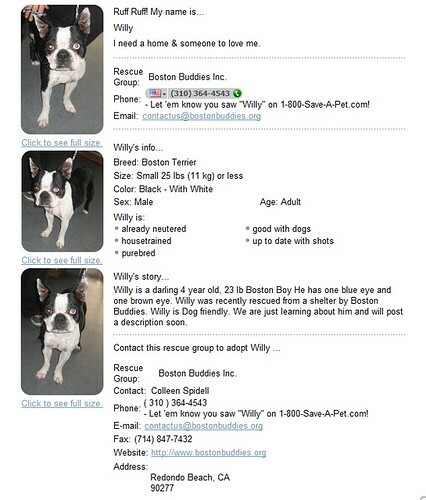 I remember visiting the BostonBuddies website everyday to look at “Willy”‘s picture and to see if there was any new info on him. And then I finally gave in and rang Rachael for a description. This was what Rachael said to me: “Lili, Willy is PERFECT. I want to take him home myself. He is a calm dog… he is perfect.” And then she told me that there were two other people interested in him… did I want to meet him? The lady who ran the boarding house – you could tell – was disappointed to let him go. She had bonded with this boy. He was her favorite. Regardless, I love Boogie. I cannot imagine life without him. He puts a smile on my face every morning and gets me out of my chair during the day (…to chase him, ball in mouth, around the apartment). He is a bundle of sweetness and amusement. He is the best little dog in our world. Thank you, Boston Buddies, and HAPPY BIRTHDAY BOOGIE MONSTER! Shame on me for not having updated Boogie’s Myspace blog in months! Does no news = good news? Well, not much has changed. Boogie is still pretty much the same little lovable ball-obsessed monster and I can’t imagine life without him. He still murders cushions, goes through the trash, steals my shoes (amongst other things) and moves furniture around when I am not at home. On occasion, he still lunges at people and dogs that he doesn’t know and pulls on his leash. Some days I think he is becoming a “good dog” (like the random days that he DOESN’T pull on his leash and is nice to everybody) and then lo and behold, he reverts back to his rascally self. Yes, I know. I spoil him. 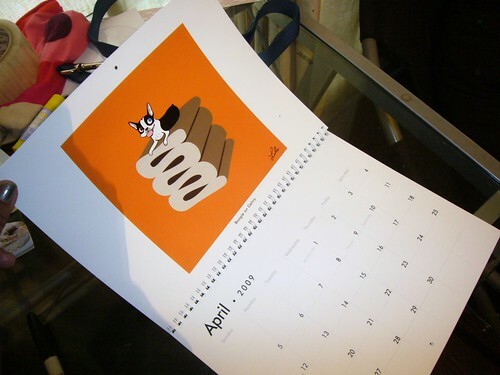 I want to share with you my latest piece of Boogie art – a 2009 wall calendar! 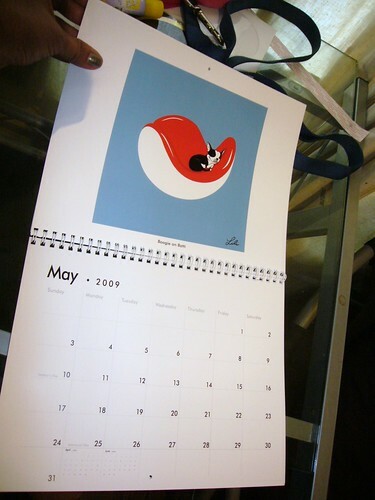 My copies arrived today from zazzle.com and I am really pleased how the printing turned out. 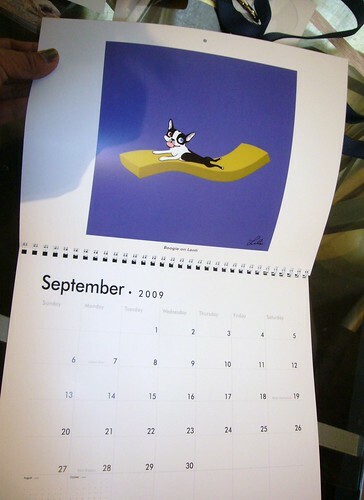 This Standard size (11 x 17) calendar is about $20 and the prints are about $10 each. I believe there is some sort of sale or coupon code offer happening on zazzle right now. 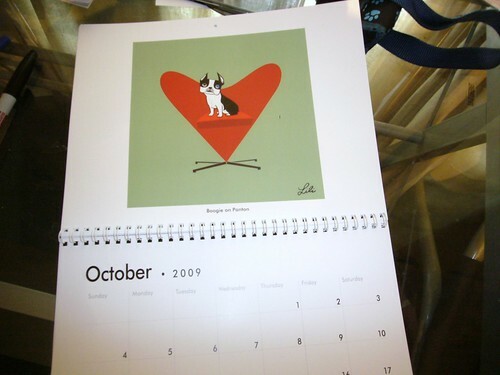 UPDATE: I just found out that if you order before Nov 29th, and use the coupon code CALENDARSAVE at checkout, you get 40% off the price of the calendar! And if your order is over $45, also use HOLIDAYSHIPS to get free shipping. In the meantime I am still taking doggie drawing commissions and donating a percentage to Boston Buddies. P.S. On December 11th, Wes and I will have had Boogie for ONE YEAR. We are going to take Boogie’s Adoption Day as his birthday because we don’t know what his real birthday is. We don’t even know his exact age. Some records say he’s 5, some say he’s 6.